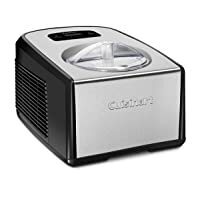 Use Cuisinart recipes included in the Instruction Booklet or use your own recipe, making sure your base does not go over the top dasher on the mixing paddle. 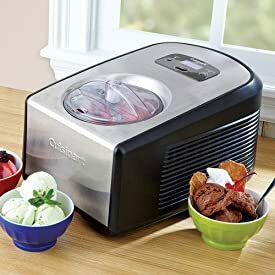 Gelato and sorbet bases should be no more than 1 quart and ice cream bases should be no more than 5 cups. The ingredients will increase in volume during the freezing process. For best results, prepare the ingredients in a container from which it is easy to pour. Place the mixing bowl into the base. Place the ice cream or gelato/sorbet paddle in the mixing bowl so it rests in the center of the bowl. Pour ingredients into the mixing bowl. Press the Power button to turn the unit on and then set the timer per the recipe. The timer will default to 60 minutes. Press the Start/Stop button to begin the Mixing/Cooling cycle. Add ingredients such as chips and nuts towards the end of the mixing time once the mixture has begun to thicken. Once the set time concludes, the 10-minute Keep Cool cycle will keep your ice cream or gelato cool. When the frozen dessert is ready, transfer to a freezer-safe, airtight container for longer storage in the freezer.